ServiceClarity allows you to create connections from multiple sources, add metrics, track KPIs and generate reports to communicate with users and audiences. Here’s a quick guide to start automating your metric reporting and measure those key business metrics. You can login to your ServiceClarity account here, Login. ServiceClarity integrates out-of-the-box with a broad range of cloud services including JIRA, ServiceNow®, Amazon Web Services, Pingdom, Hubspot and many more. Below are steps on creating a JIRA connection but can be applied across other connections. Navigate to the connections page from the main menu options. From here you will see a list of your current connections and their status or be prompted to create a new connection. A new connection can be created by clicking ‘New ‘ in the top right actions bar. Select JIRA & JIRA Service Desk as the Connector Type and give the system a name. You can choose from a selection of previous connection configurations or use the default. Once saved you must complete configuration by adding your JIRA URL, username and password. It is now even easier to filter your JIRA data. Under the data collection configuration section you can specify filters on a connection level to filter your data by project or issue type. This lets you focus on a specific project then define the workflow states, breakdown data and any additional JQL queries for that project. Making it easier for you to build connections across multiple projects and start comparing these projects to monitor and continually improve development processes. Check out our help centre guides on creating connections and getting the most out of your JIRA data. Your connection has been created so now you’re ready to start adding metrics. For a full in-depth look at creating metrics and KPIs see our Working with ServiceClarity KPIs workbook. Metrics that matter. Now that you have a connection set up it’s time to get the most out of your JIRA data. Data is key and we believe in getting the best you can from the data you have. ServiceClarity provides a set of unique data collectors specifically for working with your JIRA data. These range from simple issue counters to time trackers and also more specialised JIRA ServiceDesk SLA trackers or JIRA Agile Story Points and Epics. Metrics are added to specific connections. New metrics can be added using the ‘Add +’ button on the Metrics header. You will see any metrics linked to a connection under the Metrics header with the option to click on the metric name to view or edit its details. Click ‘Add +’ to create a new metric for the connection. Choose from the Metric Data Collector options. Add your JQL filters, from the 4 most popular or customise your own. Each metric will use the default connection configuration for data fields and breakdown values. Data Collection Configurations can also be set at a metric level to further refine and customise individual metrics. Creating connections and metrics is the base to getting the data you need. Filtering to include the data that is key to your tracking and business processes. Now that we are collecting data from our connections into metrics it’s time to start creating KPIs with this data to explore and leverage it for key insights. Have a look at our complete example report looking at JIRA story reporting (using the issue counter data collector) across a JIRA development team. Now that you have your metrics defined it’s time to convert these to KPIs, or combine multiple metrics, to discover the power of ServiceClarity KPIs. Using ServiceClarity and JIRA we can create KPIs that will highlight key insights and drive optimisation answering common questions, What is the quality of work being delivered? Are tasks being resolved as quickly as possible? and Are we on budget? The simplest KPI calculation is a single metric converted to a KPI that is a direct daily aggregate without adding a formula. But ServiceClarity KPIs can be extended by combining multiple metrics or building on existing KPIs. New metrics can be easily converted to KPIs or added to new KPIs. When clicking ‘Convert to KPI’ a New KPI window will allow you to add a KPI name, reference, units and the chance to set red and amber warning levels. Once saved your new KPI will be created and all details can be modified in the KPI details page. The ‘KPI Calculation Definition’ and ‘KPI Calculation Constants’ can be added and edited. You will see the metric that you converted is used to calculate the KPI under ‘KPI Calculation Parameters’. You must have at least one metric or KPI in order to collect data. Creating new KPIs, without converting, can be done by selecting KPIs on the main menu and ‘New ‘ in the top right actions bar. The same New KPI window will allow you to create a new KPI but it won’t start collecting data until at least one metric or KPI is added to the calculation parameters. The KPIs you need all in one place. Driving rapid growth means continually monitoring changes and staying on top of what is happening throughout the business, across multiple projects, in real-time. ServiceClarity KPI reporting means all your key metrics are in one place giving teams and executives access to their key metrics looking at the present, the past, warnings and highlighted trends. All your new KPIs can be seen under the main menu KPIs option. You can create a new report from one or multiple KPIs by selecting add to new report. Once all your KPIs have been selected, to generate the new report select the ‘New Report’ button in the top action bar. Your full reports list can be found in the Reports option in the main menu. Have a look at our complete example report looking at JIRA story reporting across a JIRA development team. Communicate effectively with everyone in the organisation. Provide secure access for your senior executives, product managers, business managers, partners or customers to view specific automated reports on a scheduled date. Click on the report name, from the Reports main menu list. In the top action menu select Publish. A publish report dialogue will allow you to publish to existing users or add new users. 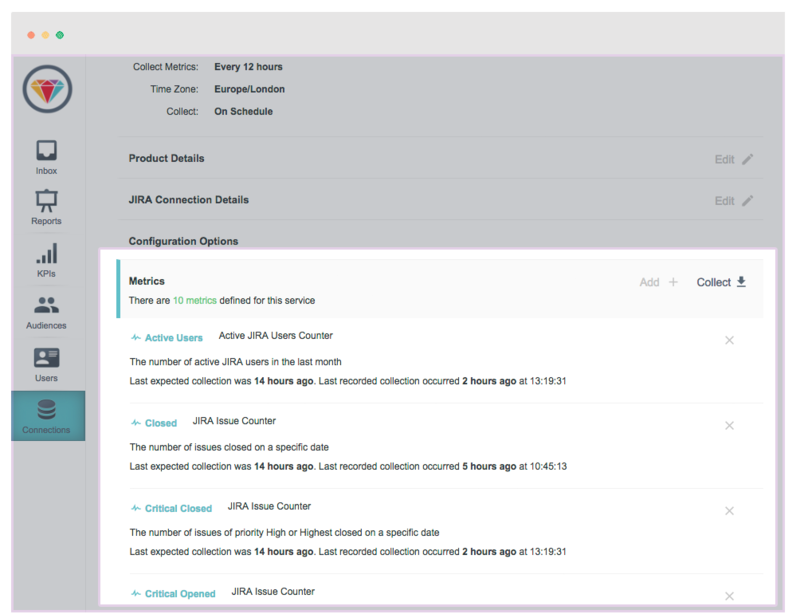 Add comments to highlight trends and alert customers to specific KPIs. Logged in customers can respond and add their own comments. When your report is published your audience will receive an email notification and link to view the report. You can also enable the Public Share option that creates a URL for you to copy and share. Publish a report to customers. Sending an automated report email with a secure link to their available reports where they can login at any time. Create a shareable URL to be distributed how you wish. Download a report and print. Have a look at our complete example report looking at JIRA story reporting, shared through a shareable URL.